Locks and keys were known long before the birth of Christ. They are mentioned frequently in the Old Testament and in mythology. In the Book of Nehemiah, chapter 3, it is stated that when repairing the old gates of the City of Jerusalem - probably in 445 B.C. - they "set up the doors thereof, and the locks thereof, and the bars thereof." At this time, locks were made of wood. They were large and crude in design; yet their principle of operation was the forerunner of the modern pin-tumbler locks of today. As locksmiths and metal workers became proficient in their craft, they were invited to make locks and keys for the Royal Courts and for the churches and cathedrals of Europe. They excelled in elaborate and high and highly detailed ornamentation - often adapted to the religious theme. In India, in the days of the Emperor of Annam, valuables were sealed into large blocks of wood, which were placed on small islands or submerged into surrounding pools of the inner courts of the palace. Here, they were protected by the royal "guardian angels," a number of crocodiles kept on starvation rations so they were always hungry. To venture into the water meant certain death for the intruder. 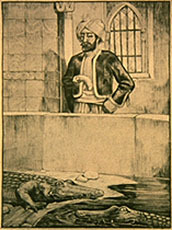 The legitimate approach to the treasure was to drug or kill the crocodiles. For many hundreds of years, cords of ropes made of rush and fiber were used to "lock" doors and tie up walls. The legend goes, a knotted rope became a famous symbol of security. Intricately tied by Gordius, King of Phrygia, and known by his name, the Gordian Knot, secured the yoke to the shaft of his chariot. Its untying was pronounced by oracles to be possible only by the man destined to conquer Asia. However, when Alexander the Great failed to undo the Gordian Knot, he cut it swiftly with his sword, giving us the expression, "to cut the Gordian Knot," meaning a bold, decisive action, effective when milder measures fail. Brass and iron padlocks found in Europe and the Far East were popularized by the Romans and the Chinese. They were particularly favored because they were portable. They operated by keys that turned, screwed, and pushed. The push-key padlock was of simple construction, the bolt kept in locked position by the projection of a spring or springs. To unlock, the springs were compressed or flattened by the key, which freed the bolt and permitted it to slide back. 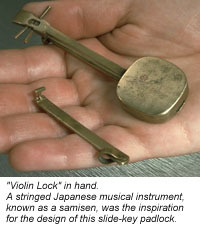 Padlocks of this type are most universally used in the Orient today. The decoration reflects the arts of the countries, and shapes often took the form of animals - dragons, horses, dogs, even elephants and hippopotamuses. Padlocks were often presented in pairs as gifts, with congratulatory messages in cuneiform characters. The first mechanical locks, made of wood, were probably created by a number of civilizations at the same time. Records show them in use some 4,000 years ago in Egypt. Fastened vertically on the door post, the wooden lock contained moveable pins or "pin tumblers," that dropped by gravity into openings in the cross piece or "bolt," and locked the door. It was operated by a wooden key with pegs or prongs that raised the number of tumblers sufficiently to clear the bolt so that it could be pulled back. This method of locking was the forerunner of modern pin tumbler locks. The first all-metal lock appeared between the years 870 and 900, and are attributed to the English craftsmen. They were simple bolts, made of iron with wards (obstructions) fitted around the keyholes to prevent tampering. The first use of wards (fixed projections in a lock) was introduced by the Romans who devised obstructions to "ward off" the entry or turning of the wrong key. Wards were notched and cut into decorative designs, and warding became a basic locking mechanism for more than a thousand years. The first padlocks were "convenient" locks as they could be carried and used where necessary. They were known in early times to merchants traveling ancient trade routes to Asia and Europe. 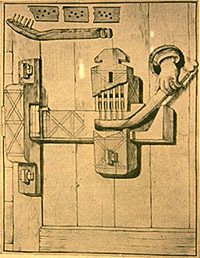 New concepts for locking devices were developed in Europe in the 17th century. Early Bramah locks utilized a series of sliders in a circular pattern to provide exceptional security. Bramah is the oldest lock company in the world and is continuing to manufacture its famous mechanism 200 years later. The first wooden lock was discovered in Persia as Khorsabad in security gate in the palace of Sargon II, who reigned from 722 to 705 B.C. In appearance and operation, it was very similar to this wooden cane-tumbler locks. The pegs at the bit end of the key correspond to the bars, or the tumblers, in the bolt. When inserted, the pegs lifted the tumblers so that the bolt could be retracted and the door or gate could opened. Designs of locks and keys were notably influenced by gothic architecture with evermore elaborate ornamentation continuing into the period of the Renaissance. Master locksmiths were invited to make locks for noblemen throughout Europe. Because of this practice, it is difficult to document an antique lock as having been produced specifically in the country where it was in use centuries ago. The period from the 14th through the 17th century was one of artistic accomplishment by superb craftsmen. Locksmiths were skilled metalworkers who were becoming internationally famous. They were invited to construct special locks for noblemen throughout Europe. Using designs of coats-of-arms and symbolic shapes, they devised intricate wards and bits for locks and keys and were inspired to produce increasingly ornamental locks to harmonize with the architecture of their clients' estates or castles. However, there were few improvements in locking mechanisms. Security depended upon intricacies such as hidden keyholes, trick devices, and complicated warding. There was little significant improvement in locking mechanisms in the 14th and 15th centuries. However, ornamentation became increasingly elaborate. Craftsmen excelled in metal work and designed and produced locks for gates, doors, chests, and cupboards. A "Masterpiece" lock was never used on a door. It was designed and produced as a one-of-a-kind by a journeyman locksmith, or iron monger as a "test" to qualify him as a Master. Masterpiece locks were often displayed without covers to show the component parts of the mechanisms, their functions, the decorative designs of lockcases, and method of assembly. Padlocks were known early in time to the Greeks, Romans, Egyptians, and other cultures of the Near East, including the Chinese. It was believed that the padlock was first used as a "travel" lock to protect merchandise from brigands along ancient trade routes and seaboards and waterways where commerce was centered. Made in small sizes to those of tremendous proportions, they represented various geometric shapes, religious symbols, animals, fish, birds, hearts. They were operated by keys that turned, screwed, pushed, and pulled. For better efficiency, letter locks, or combination padlocks, were developed, which eliminated keys and operated by alignment of letters or numbers on revolving disks. 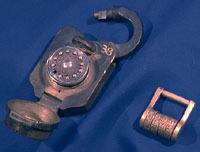 Shown here is an American padlock dating back to the turn-of-the-century. In the popular circular shape, this lock was probably used on a huge strongbox. It has a single ward (obstruction) which the key bypasses to project the bolt. Padlocks were used throughout the centuries to lock prisoners and possessions. They were usually made of iron, bronze, or brass, and were rugged in construction. However, internal locking mechanisms were often fairly simple and easy to defuse. This massive Russian padlock shown here was meticulously hand-forged early in the reign of the last Czar, Nicholas II (1895-1918). The large circular ring on the top is the "handle" or bow of a threaded key which is rotated into the keyhole to disengage the locking mechanism. When the shackle is in the locking position, the key is removed, and the plug is inserted to give the illusion that there is no keyhole. The threaded portion of the key is then screwed into its protective cover. As lock-picking became an art in the 18th century, the inventor met the challenge of the burglar with increasingly complicated locking mechanisms. 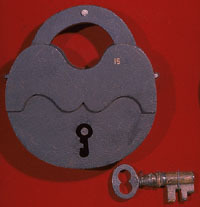 Among the new improvements were keys with changeable bits, "curtain closed-out" around keyholes to prevent tampering, alarm bells combined with the action of the bolt, and "puzzle" or ring padlocks, with this principle developing into dial face and bank vault locks, operating without keys and known as combination locks. The early puzzle padlocks were Oriental with from three to seven rings of characters or letters which released the hasp when properly aligned. The dial locks were similar in operation, and both types were combinated to unlock to words or patterns of numbers known only to the owners or responsible persons. At the left is the Eureka, a manipulation-proof combination lock with five tumblers. For a faithful bank vault used at one time in the U.S. Treasury Department. Patented in 1862 by Dodds, MacNeal, and Urban of Canton, Ohio. The operating dial is a combination of letters and numbers and affords 1,073,741,824 combinations; to run through them all without interruption would take 2,042 years, 324 days, and 1 hour. During the gothic era, followed by the exuberant influence of the Renaissance, master locksmiths were inspired to product the most intricate and the finest ornamental locks of all time. This was the period when iron craftsmen and lock artisans became internationally famous. They excelled in the forging, embossing, engraving, chafing, and etching of metals, and were invited to make locks and keys for the courts of Europe. 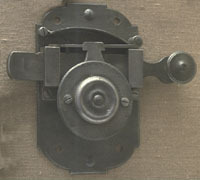 Shown here is a spring latch lock for a castle door. Its working mechanism is concealed in the classic dome, or ward house, that shows the Moorish influence. Ornamented in the style of the period with mythical figures and scrolls, it is particularly noteworthy as it illustrates the coloring of metal, similar to the "niello" process. As the craftsman lacked color, he created various stains for metal, which he used for backgrounds to highlight his design. 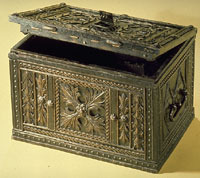 Since the earliest times, chests were secured with strong and frequently very large locks. They were used to protect precious metals, money, jewels, to store clothing, and church vestments, archives and arms, linens and other household articles, bridal finery, and even for burial of important people. Chest locks were ornamented for household use, or were very plain and sturdy for chests that were to be transported. Generally, they were mounted inside the chest, in a vertical position, with bolts spreading to slide into the lid keeper. In pioneering days of Colonial America, the "key" to the lock of the house often hung on the outside of the door. It was a length of string. Doors were latched on the inside with a pivoted wooded bar or bolt, one end dropping into a slot in the jamb. Attached was a piece of string that was threaded through a small hole to the outside. To the visitor, the dangling string was an immediate welcome, as pulling on it, raised the bolt and opened the door. This lock and key became the origin of our expression of hospitality, "the latch string is always out." Several centuries ago, in Spain, there was a great distrust of locks. To be safe, the householders of a block hired a watchman to patrol the neighborhood and carry the keys to their dwellings. To enter or leave a house, the resident clapped his hands vigorously to summon the watchman with his key, so, all comings and goings became a matter of public record and there was little chance for "hanky panky" in old Madrid. His name was Louis, Louis XVI, King of France. Louis didn't particularly like the business of being a king, but he had an extraordinary interest in mechanical labor. He spent many happy hours in his house workshop forging metal and making locks, skills taught to him by a locksmith named Gamin. He was particularly proud of an iron security cabinet which we concealed in a wall to protect his private papers. Unfortunately, Louis didn't reckon with the Revolutionists, as his secret hiding place was revealed by Gamin, and his papers incriminated him. History says, poor Louis, he was as good a locksmith as he was a bad king. As a child, Charles Courtney was intrigued with everything mechanical that he could fix or take apart. He was especially fascinated with locks, and so began his lifelong career as a lock expert. However, he had resolved to become a diver and do all the things his great, great uncle, Jules Verne, a novelist, had described in his famous book, Twenty Thousand Leagues Under The Sea. Years later, Charles Courtney realized his dream. Because of his talent for picking locks, he was hired as a diver to open safes on sunken ships. He was the first to do a locksmithing job 400 feet under water, and he recovered many millions of dollars for the salvage companies. Charles Courtney achieved international fame as a Master Locksmith, also known as a collector of antique locks, many of them now a part of the Schlage collection. Country banks, in the early 1800s were housed in crude buildings. Safes were simple wooden shafts or strongboxes reinforced with sheet iron and secured with padlocks. It was "easy money" for criminal to break in and smash the safe, or carry it away for "cracking" in privacy. So began the race between safemakers and safe breakers, or "yeggs" as they were called. Manufacturers started to build solid iron safes with key-operated deadbolt locks; yeggs soon defeated them by pouring explosives into the keyholes and blowing the doors off their hinges. For better protection, lock makers developed combination locks without keyholes, later combining them with tiny mechanism. Vaults of steel and concrete were built into the structures of banks. Multiple locking procedures were devised and so passed the era of the yegg. 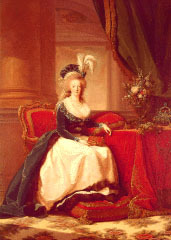 Catherine the Great, Czarina of Russia from 1762 to 1796, had one of the most notable lock collections of her time. She admired the fine workmanship of artisans who designed ornamental faceplates for locks and created padlocks in fanciful forms to please a lady or a favored child. It is said that a famous Russian locksmith gained his freedom from banishment to Siberia my making a chain for Catherine. She was so impressed with his craftsmanship that she pardoned him. As the story goes, this incident is credited with the origin of a saying that "it takes 89 keys to unlock a prison." 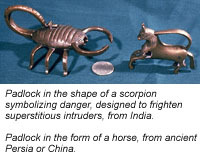 In the mid 1700s, locks were few in the Colonies and most were copies of European mechanisms. With the founding of the Republic and the new prosperity, there was a growing demand for sturdy door locks, padlocks, and locks for safes and vaults, and so the American lock industry had its start. Each native craftsman had his own ideas about security, and between 1774 and 1920, American lockmakers patented some 3,000 varieties of lock devices. Among was the patent for a "domestic lock," by Linus Yale, Sr. This lock was a modification of an old Egyptian pin-tumbler principle that utilized a revolving cylinder. In the early 1920s, Walter Schlage advanced the concept of a cylindrical pin-tumbler lock by placing a push-button locking mechanism between the two knobs. Emphasis was on security; yet equally important to the modern architect and decorator, the lock became an intricate part of the door design. It was now possible to select complimentary styles of locks, metals, and finishes. Shown here is a rim lock from Fort Sumter at Charleston Harbor, South Carolina. The Fort was the site of the start of the Civil War. On April 12, 1861, the Confederate forces opened fire on Fort Sumter, a federal garrison. After a bombardment of 36 hours, the Fort surrendered on April 14. 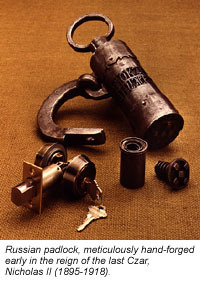 The lock was found by Captain James Kelly, formerly a blockade runner, when he was delivering materials for the rebuilding of Fort Sumter at the close of the Civil War. The revolutionary Schlage lock is a completely different concept of a cylindrical lock with the button-in-the-knob mechanism placed between the knobs, introduced by Walter Schlage in the early 1920s. During the Middle Ages, locks and keys were highly ornate. Iron began to be worked cold. It was no longer necessary for the smith to work quickly at the forge; he now used a file, a cold chisel, and a saw with extraordinary dexterity. The master locksmith designed special locks for cathedrals and churches in the shape of a cross and embellished them with elaborate decorations. He acquired expert skills in repoussé , ornametations, overlays, embossing, chaffing, piercing, and created delicate fretwork in the popular scroll and leaf patterns of the period. Above is a Spanish chuck lock and key with hinged hasp and rim or lockplate with pairs of facing animals. Belonging to Queen Isabella, this lock was probably used to secure a storage chest that may have contained her royal robe and personal fortune. For many centuries, keys represented authority, security, and power. Gods, goddesses, and saints are described as holders of the keys to the Kingdom of Heaven, to Bottomless Pit, to Gates of Earth and Sea. Kings, emperors, nobles of the court, and cities and towns incorporated the symbol of the key into banners, coats of arms and official seals. The delivery of keys to a castle, fortress, or city was a ceremonial event, as is the presentation of the Key-To-The-City today to a visiting dignitary. Shown here is a large Roman key. 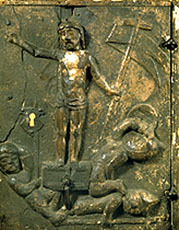 The key was a symbol of man's status, his authority. Many centuries ago in Egypt, the importance of the "head of the household" was determined by the number of keys he owned; they were large and were carried by slaves on their shoulders. Should he have several slaves, or key bearers, he was considered to be a man of great wealth and distinction. So, through the ages, the lock and its key have become an intricate part of our culture. Locking up personal property, the key symbolizes our desire for privacy and security for our possessions. This emblem of keys from the early Roman period to the 19th century may include a master key or two, but there are no duplicates. If you have visited the Tower of London, you will remember the warder, dressed in a red tunic and wearing a Tudor hat and ruff. Familiarly, he is called a Beefeater. Specifically, he is an Honorary Yeoman of the Guards, a member of the Queen's bodyguard. If you spoke to him, you may have heard the story of the Ceremony of the Keys. Every night, the Chief Warder locks the Tower gates and brings the keys to headquarters in the ancient fortress. The sentry calls out "Halt! Who comes there?" "The Keys." "Whose keys?" "Queen Elizabeth's keys." Everyone presents arms and the warder calls out, "God preserve Queen Elizabeth." The guard responds, "Amen." Tonight and every night, this traditional ceremony of Britain continues. The yeoman repeats the same words that have never been changed in 450 years.